On July 9, 2018, the German Commissioner for the peace process in Colombia, Tom Koenigs, visited the CAPAZ Institute in the Claustro de San Agustín. Mr. Koenigs spoke with Gloria Castrillón, the editor-in-chief of Colombia 2020 of El Espectador, for the media alliance with TV Channel Canal Caracol. 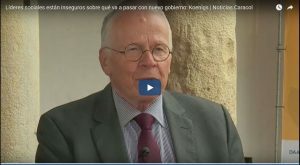 In the interview Koenigs discussed the current security situation of social leaders in Colombia. On his most recent visit to Tumaco, in southwest Colombia, Koenigs noticed the people’s fear of the escalation of violence. Being asked about the Special Jurisdiction for Peace (JEP), Koenigs was quite optimistic about it. He questioned the recent changes to the JEP proposed by the incoming government. He encouraged the public to trust in the judicial instances and to recognize shared responsibilities in the armed conflict. Koenigs questioned the policy of illicit crops eradication in Colombia using glyphosate. He recalled the need for the implementation of an agrarian reform and the supply of legal mechanisms for alternative uses of the land to the Colombian farmers. 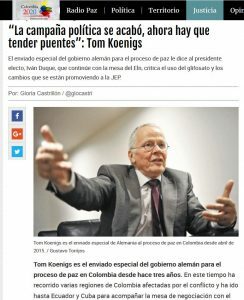 According to Koenigs, the German government and the international community support the peace process in Colombia. On the current negotiations with the guerrilla ELN, he emphasized the notion of presenting pragmatic results. He also invited the new government to generate changes that allow progress in the implementation of peace agreements already signed with the FARC-EP guerrilla and those that can be reached with the guerrilla ELN. You can read complete interview with Tom Koenigs on the website of Colombia 2020 of El Espectador (in Spanish, published on 16 July, 2018).